On September 30 the U.S., Canada and Mexico announced that they had agreed on a new “U.S.-Mexico-Canada Agreement” to replace the North American Free Trade Agreement (NAFTA). The new trade pact contains modest improvements for workers, but falls far short of the transformative changes demanded by the labor and progressive movements. It also includes new corporate giveaways, especially to banks, pharmaceutical companies, tech companies and the energy industry. UE, together with our allies in Mexico and Canada, mobilized to demand that the needs of working people be put front and center in the renegotiations. UE members signed and collected postcards opposing NAFTA’s notorious Investor-State Dispute Settlement (ISDS) process during and after the 75th convention last summer. ISDS gives corporations the right to sue governments for trying to protect their people or the environment, if those protections could in any way lead to lower profits. UE also participated in a #ReplaceNAFTA Day of Action in December, mobilizing members to call Congress to demand a worker- and community-friendly agreement. UE General President Peter Knowlton joined leaders of other organizations, including Public Citizen, the American Federation of Teachers, the National Farmers Union and the Catholic social justice lobby NETWORK, at a #ReplaceNAFTA press conference in Washington, DC. UE also participated in meetings to build international solidarity in Mexico and Canada, and helped coordinate and host a trinational conference of trade unionists from all three countries in Chicago last October. The trinational gathering held a rally outside the Mexican Consulate in Chicago to draw attention to the Mexican government’s failure to protect the rights of their own workers during the NAFTA negotiations. It was led by representatives from several independent Mexican labor organizations, including longtime UE ally the Frente Auténtico del Trabajo. The attention brought to ISDS and labor conditions in Mexico by the labor and progressive movements did produce some improvements over the original NAFTA. 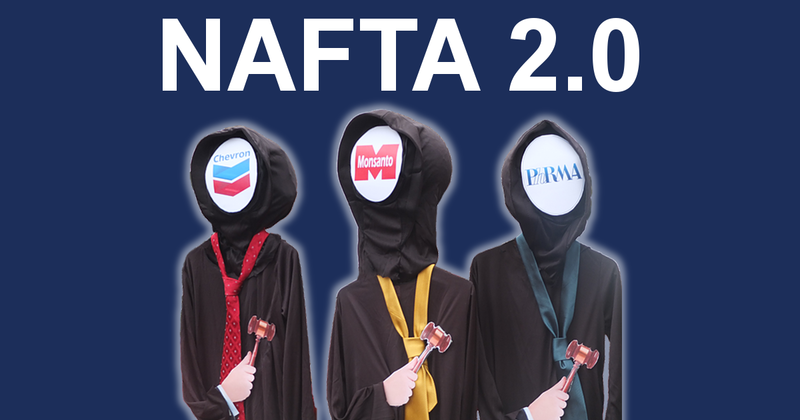 The new agreement terminates ISDS between the U.S. and Canada three years after it goes into effect, and moderates ISDS between the U.S. and Mexico — thus removing (eventually) one of the key incentives for outsourcing jobs to Mexico. The new agreement includes modest improvements to language about labor standards, though without any mechanism for swift and sure enforcement. It also includes provisions strengthening “rules of origin,” especially in the automotive sector, though many economists are skeptical that this will in fact create jobs in the U.S. or raise U.S. wages. The small improvements on labor issues undoubtedly reflect the pressure put on all three governments by workers and their unions. We hope its provisions on automobiles will lead to more stability for U.S. and Canadian auto workers, but it falls far short of our demands for an agreement that raises living standards for workers across industries and across borders through protection of labor rights and investment in infrastructure, jobs and social programs. The agreement also includes new giveaways to corporations, some of them worse than in the original NAFTA. It creates new loopholes for nine oil and gas companies with contracts in Mexico, preserving their ISDS rights. The new agreement does little to address the biggest cause of outsourcing of jobs to Mexico, which is the abysmally low wages in Mexico and the suppression of independent trade unions. UE has long held that the solution to outsourcing and runaway shops is solidarity with Mexican workers’ struggles to form independent unions and raise their own wages. While NAFTA was being renegotiated, the Mexican Senate introduced legislation that would have rolled back recent improvements in the ability for independent unions to organize. UE helped mobilize opposition to this in the U.S., collecting over 1,000 signatures in an online petition calling for US Trade Representative Robert Lighthizer to demand a rejection of this legislation as part of the NAFTA negotiations. Fortunately, the legislation did not pass out of the Mexican Senate before their session ended. On July 1, the Mexican people elected a new, more worker-friendly president, Andrés Manuel López Obrador, who has pledged to raise Mexico’s minimum wage and is expected to create a better environment for independent trade unions. López Obrador will take office on December 1, which gave his business-oriented predecessor extra incentive to complete the NAFTA negotiations this fall. In contrast to the secrecy with which NAFTA was negotiated, UE’s Canadian partner Unifor has been conducting a “People’s Trade Campaign” throughout their country. They have been holding open town hall meetings that bring together union members and other working people, environmental activists, academics and researchers, farmers, students, indigenous communities, owners of small businesses and local politicians to develop a vision for trade which benefits people, not corporations. Unifor’s Atlantic Regional Director Lana Payne notes that about two-thirds of Unifor members work in trade-related industries across Canada. “Now is the time to act and build a constructive political dialogue on trade that works for the people and not just corporations,” she says. Unifor expects these town hall meetings — which are still ongoing — will document the ideas and experiences of Canadians, resulting in a summary report and recommendations to federal politicians. UE is exploring ways to launch a similar campaign in the U.S.
Because the complex rules governing the signing of trade agreements, and the legislative calendar, this agreement cannot go to Congress for a vote until early 2019, which means there is still time to demand improvements. This new agreement does not correct the injustices that workers and our communities have suffered from NAFTA. For these reasons we reject the agreement as presently constituted and urge continued negotiations, with greater transparency and wider popular participation. Workers and our communities deserve an agreement which protects our right to a decent and environmentally sustainable living and has enforcement mechanisms to insure that sovereignty, democracy, and justice can be defended from corporate actions which benefit the 1% at the expense of the 99%.